The Joint Space Mass Matrix block returns the joint-space mass matrix for the given robot configuration (joint positions) for the Rigid body tree robot model. Joint-space mass matrix for the given robot configuration, returned as a positive-definite symmetric matrix. Calculate the mass matrix for a robot manipulator using a robotics.RigidBodyTree model. 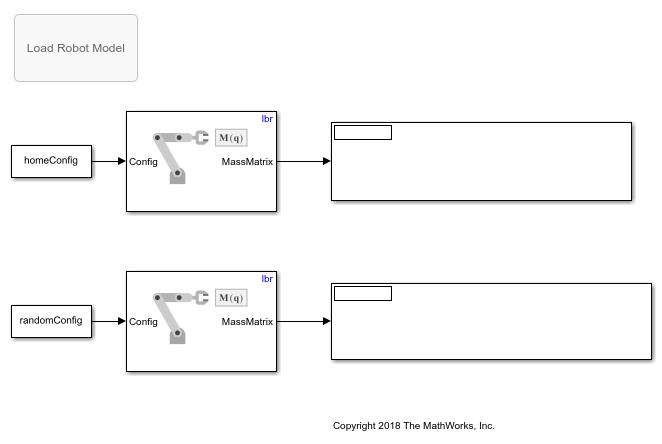 In this example, you define a robot model and robot configurations in MATLAB® and pass them to Simulink® to be used with the manipulator algorithm blocks.